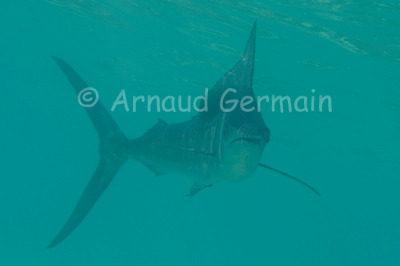 arnaud germain wildlife photography: Sailfish Coming! Getting a sailfish pointing its rostrum straight at you is an unforgettable experience. It happened in the shallow bay of Marsa Abu Dabbab. I swam with the sailfish for about 5 minutes, taking about 50 pictures in the process. It is usually very rare to encounter these pelagic fish, even rarer to do so in waist deep water! A real privilege! Nikon D700, Nikon 28-105 mm macro at 70mm, F9, 1/500th, ISO 400, Ikelite Housing. No strobe.